(a) Visually check the belt for excessive wear, frayed cords, etc. If any defect is found, replace the drive belt. HINT: Cracks on the rib side of a belt are considered acceptable. Replace the belt if there are any missing ribs. (a) Keep the vehicle level. (b) With the engine stopped, check the fluid level in the oil reservoir. If necessary, add fluid. HINT: When hot, check that the fluid level is within the HOT LEVEL range on the reservoir. If the fluid is cold, check that it is within the COLD LEVEL range. (c) Start the engine and run at idle. (d) Turn the steering wheel from lock to lock several times to raise fluid temperature. (e) Check for foaming or emulsification. If foaming or emulsification is identified, bleed air in the power steering system (see step 3). (f) With the engine idling, measure the fluid level in the reservoir. (h) Wait a few minutes and measure the fluid level in the reservoir again. If the fluid level rise exceeds the maximum, bleed air in the power steering system (see step 3). (i) Check the fluid level. 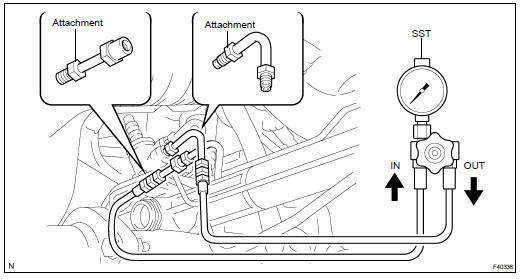 NOTICE: If you replace or separate the components for power steering oil pressure line, bleed air in the power steering system after the operation. (a) Idle the engine at 1,000 rpm or less until bubbles in the fluid disappear. (Be sure not to turn the steering wheel.) (b) When the bubbles disappear, slowly turn the steering wheel from lock to lock 2 or 3 times. (c) Repeat procedures (a) and (b) until the fluid level in the reservoir becomes stable and bubbles disappear. If the fluid level goes below the MAX line, add fluid. (d) When the fluid level becomes stable, increase and decrease oil pressure 2 or 3 times for both left and right by turning the steering wheel to the full lock positions and jiggling it there. (e) Make sure that no bubbles exist in the reservoir. When turning the steering wheel quickly or turning it from lock to lock position, check that the steering wheel is not heavy to turn and there is no abnormal noise or vibration. (f) When there are fluid leaks or abnormalities after bleeding air, repair them and repeat procedures (a) to (e). If the abnormalities still exist, replace the related parts. (a) Disconnect the pressure feed tube assy (see page 30-3 ). (b) Connect SST, as shown in the illustration on the next page. NOTICE: Check that the valve of the SST is in the open position. (c) Bleed the power steering system. (d) Start the engine and run at idle. (e) Turn the steering wheel from lock to lock several times to raise fluid temperature. (f) With the engine idling, close the valve of the SST and observe the reading on the SST. Do not keep the valve closed for more than 10 seconds. Do not allow the fluid temperature to become too high. (g) With the engine idling, open the valve fully. (h) Measure the fluid pressure at engine speeds of 1,000 rpm and 3,000 rpm. NOTICE: Do not turn the steering wheel. (i) With the engine idling and the valve fully opened, turn the steering wheel to the left or right full lock position. Do not keep the steering wheel in the full lock position for more than 10 seconds. (k) Connect the pressure feed tube assy (see page 30-3 ). (l) Bleed the power steering system (see step 3). (a) Center the steering wheel. (b) Remove the steering wheel pad (see page 60-17 ). (c) Start the engine and run it at idle. (d) Measure the steering effort in both directions. HINT: Check tire type, pressure and road surface before making your diagnosis. (e) Tighten the steering wheel set nut. (f) Install the steering wheel pad (see page 60-17 ). (g) Clear the DTCs (see page 05-1215 ). (h) Inspect the airbag warning light (see page 05-1207 ).